The following is a brief overview of our Community Projects as they are updated for the year. Please refer to our Community Project Page for past years projects. Wednesday workdays will continue for growing season of 2019. Based on weather, we hope to begin in March. As with the 2018 successful schedule that proved to be very conducive for the health and appearance of the garden, scheduled days will be every other Wednesday. I will send out reminders. Work days are “if you can” and will not be a formal “show up” type of gathering. It will merely be a day that if anyone has the time, meet each other in the garden. Very casual and whatever time you want. NOTE: If you would like to choose a specific area of the garden to “adopt” and maintain or recommend modifications, let me know. Gail Kusuk has chosen the daylilies that are growing along the fence/roadway and has done a spectacular job! She works in the garden when she can and is almost a silent partner working it in around her job responsibilities. The daylilies have looked their best in a couple of years and we are very grateful. She is planning to split the daylilies and we need to help her when she calls on us. We probably will pot some up for the Fall plant sale if we have one scheduled. Cathy Haist is the “Fire Ant Eliminator Queen” and will be applying the first application soon, but the application will be based on weather conditions. 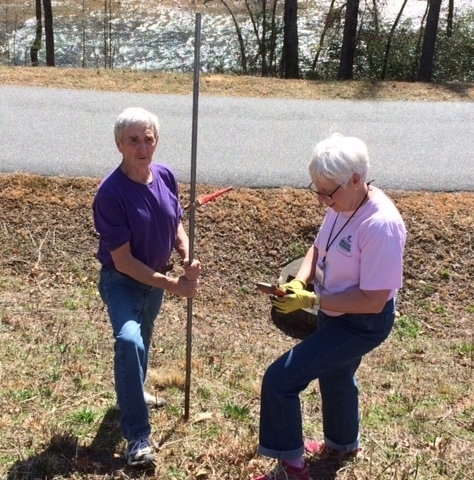 Cathy Haist has also volunteered to pursue certification for our garden for Pollinators and Butterflies. She has the authority to complete the necessary documentation and authority to purchase the certification sign. Christine Issa updated us on the “Plants of Distinction” program to possibly replace the now defunct Gold Medal Garden program. Apparently this program is housed at UGA’s Trial Gardens and trials new varieties of annuals from top breeders worldwide and tests a few perennials for southeast heat and humidity. The program seems to focus more on new cultivars of annuals rather than perennials. The availability of and growing conditions may NOT be suitable for Blairsville. 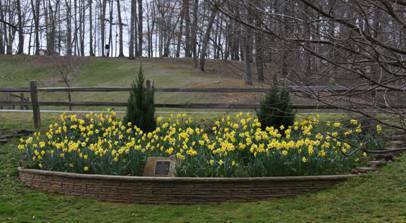 There are other areas in the US that have continued the Gold Medal Garden distinction, some use the same growing zone as Blairsville. Maybe, at this time we post-pone changing our garden’s name and stay a Gold Medal Garden for the current residents we have chosen. We will continue to “add to” and “refresh” what we have! 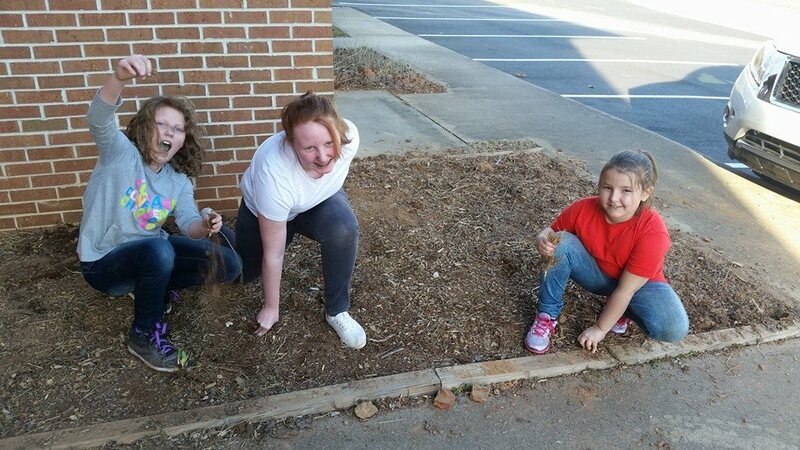 Elaine Bliss researched soil costs and composition for our proposed “raised bed” gardens. It appears that her research reveals that the best “cost” and “composition” would actually be from local Appalachian Timber. They will deliver a “truckload”, (which is about 2-3 pick-up size loads) for about $350, which includes delivery. Discussion was held regarding using “bagged” soil mixtures, free delivery vs. $50 delivery, and using “husband’s pick-up truck to save delivery costs. It will be MUCH easier to pay the $50 delivery fee and use wheelbarrows to transport from one pile to the garden vs. off-loading the pick-up truck and transporting with wheelbarrows. It would be easiest to handle bagged soil and amendments. We are not ready to choose the easier or easiest method of obtaining the soil until we have our raised bed containers in place and will table further discussion. We know what we need for soil composition, we need to decide the logistics so that we save our backs! The proposal for the “raised bed containers” was presented to Mickey Cummings in November/December for the purpose of securing his support, both financially and with any labor help we may need. After lengthy discussion with him on how we came up with our proposal and our discussions of material types and designs, he actually rejected our request for using metal stock water tanks. Mickey and I had a good conversation and he was aware that this project had been well thought out and discussed among ourselves. Mickey wanted raised beds that might look like something the farmers of the 1800’s would use. Not to be deterred! Cathy Haist jumped in full force and located a wonderful example of a wooden trough that would have been used to feed or water farm animals! Photos were presented to Mickey and he jumped on it immediately and said he has a source for wood and a sawmill to cut the wood. He advised in Feb. that he has located Red Maple to use for the troughs but they cannot get to the wood due to the very wet conditions (march update). This looks like a major delay and I will keep after Mickey monthly to get this project done during this growing season! Elaine Bliss has herbs to plant! Waterproofing the troughs may be an issue as the 1800’s farmers may have used linseed oil, tar mixed with animal fat . . . and you may get the picture – not with edible herbs. Soooo . . . we are not worrying about water proofing the troughs at this time. 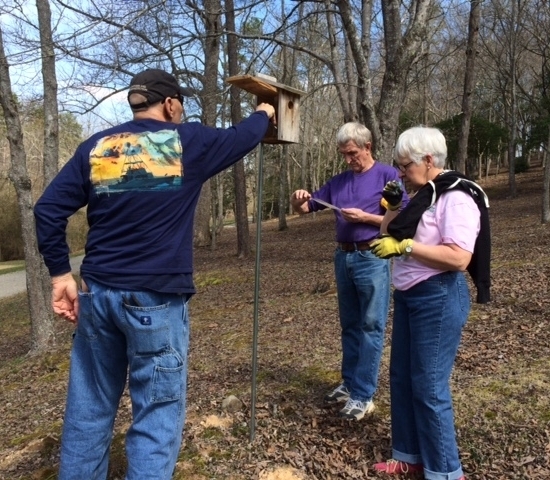 Out bigger hope is that our wonderful and talented and crafty Master Gardeners who LOVE wood working will be willing to assemble the troughs for the garden. Think about it! And will provide more information as we get closer to reality. Cardboard as mulch to control the weeds is still a viable plan. Cathy Haist has several appliance size pieces and I will find a place to store them. We will pursue this project along with Spring cleaning. The cardboard is easier to handle if it is slightly wet so I’m working on this plan. 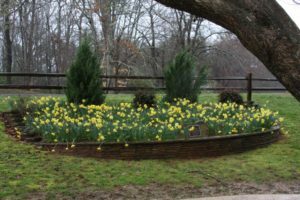 MGEV – The Gold Medal Garden at the Union County Farmers’ Market is in dire need of weeding. 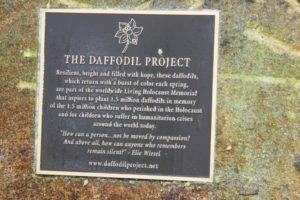 The Children’s Daffodil Garden at Meeks Park, part of the Living Holocaust Memorial of the planned 1.5 million Daffodil bulbs to be planted around the world to remember the 1.5 million children who died senselessly in Nazi occupied Europe, is now in full bloom. Please see attached photograph, courtesy of T. Spencer Allen. The photograph is beautiful but not as beautiful as seeing it in person so if you get a chance, please drive by. Tidying up and Spring weeding was completed on the 13th of February. 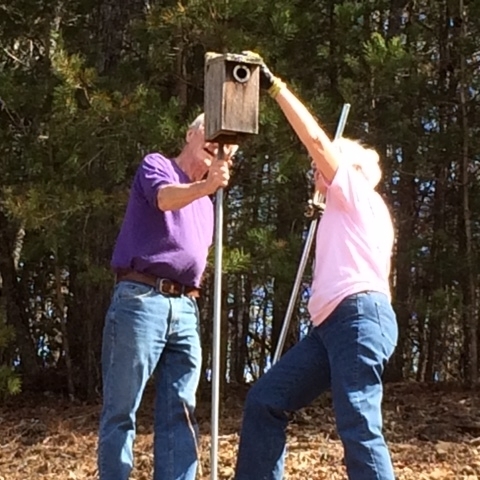 The bluebird houses at Farmer’s Market and the new courthouse in Blairsville have been cleaned out for the season. Repair was attempted on one of the houses but we will have to replace it as it has suffered damaged from some critter chewing into it. It is scheduled for repair. 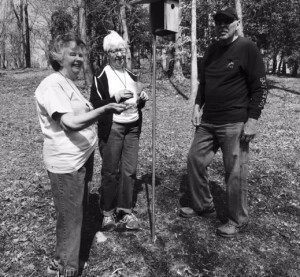 The bluebird houses at Farmer’s Market, new courthouse in Blairsville, walking trail and dog walk trail have been cleaned out for the season. 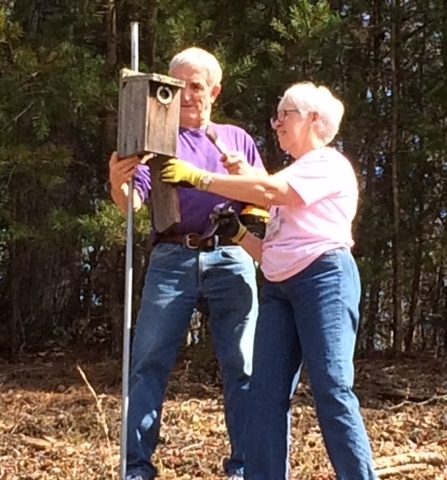 We have one repair and reinstallation on the dog walk trail. We have three houses to go back up on the walking trail, one was a repair and the other two were on poles we had installed very high up off the path and it is no longer easy to get to them. 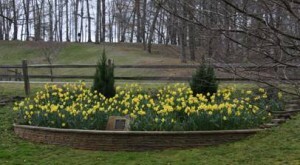 We will clear with Meeks Park the locations we would like to reinstall them in before doing it. We are going to try to get this accomplished this coming week. We had successful nesting of bluebirds in most of the houses in Meeks and the new courthouse. We have only had nests in two of the houses at Union County Farmer’s Market. 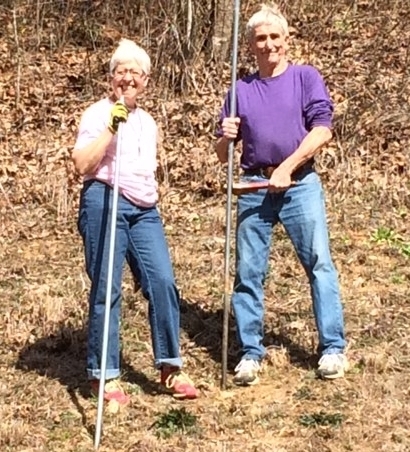 It was amazing to see Jo Anne and Tom Allen scamper up the embankments with pipe wrenches to remove two of the poles so we can use them again! I believe they have taken some lessons from their goats! We have several members of TUMGA wishing to have bluebird houses installed and we will also try to get these done. March was a very busy meeting! 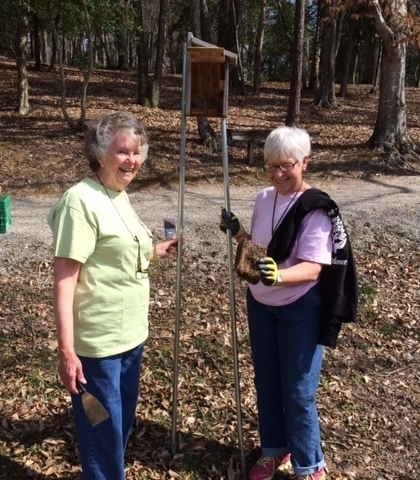 Towns-Union Master Gardeners Jo Anne Allen and Judy Caines taught the children how to read and understand the soil test in their garden and the 3 parts of the fertilizer labels, Nitrogen-Phosphorus- Potassium! 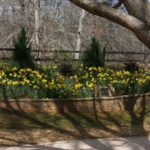 They dug up lots of weeds and a few iris bulbs that they plan to sell at the HGC Plant Affair on April 16th, to raise funds. They sprinkled fertilizer to prepare the soil for planting. 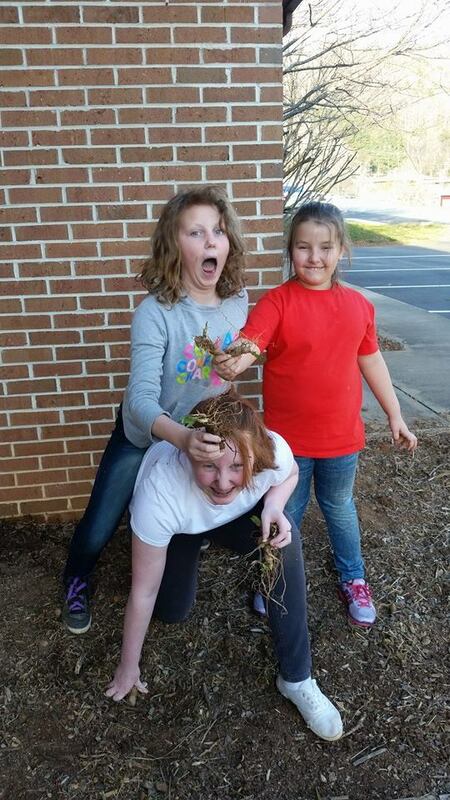 We also tried an art project using potato stamps carved by our 4-H Extension Agent, Billie Harvey. Each child was given white carnations and green food coloring with instructions how to turn their carnation green for St. Patrick’s Day. A fun way to understand the science of “capillary action”. Our next meeting will be April 11th, when the children will be planning their “Pizza” garden. We like to start about 3:30PM. If you’re interested in having your child participate, please contact Billie Harvey at the Extension Office, 706-896-2024; or email: bsharvey@uga.edu. Towns County Extension Office: Answer phones, assist customers, fill in for Administrative Assistant on as needed basis. 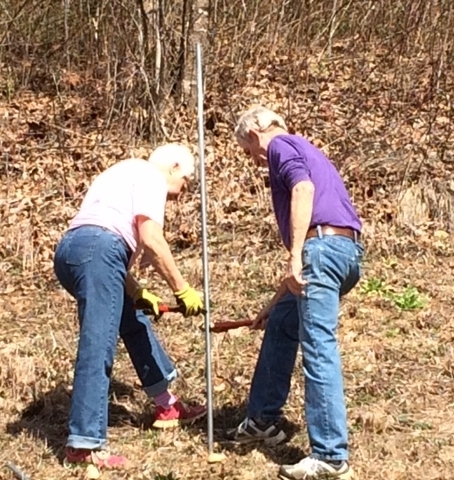 Weed, mulch and add/maintain plants and construct and install two rain barrels at the entrance. 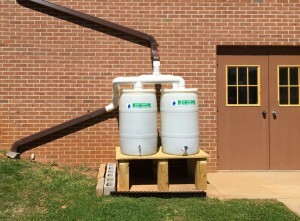 The rain barrels were designed, built, and installed by Gary Caines. It is a very impressive job because, as you can see, not only are they good to look at they were engineered correctly. Thank you Gary for a super job. There will be pictures of the additional work: the daylilies Judy, Sheleila, and Dan have transplanted to outline the bed along the wall; Also the asparagus that had grown unattended for who knows how long in the main bed was transplanted and labeled to the narrow bed along the right side of the entrance walkway and Sheleila also moved the big rocks. The finishing touch to the work was the mulch spread around the daylilies. The work done Thursday was a big step to making the entrance look like a properly tended bed. The next step is to amend the soil with a load of donated top soil. There is more to be done but it is well on the way. Stop by and see the progress. United Community Bank’s Customer Appreciation Tomato Day is May 6, 2016. Set up is 9 to 9:30 and it continues until 5 or when the tomatoes are all given out. Sign up sheet will be at the April meeting.